Boil the potatoes in a pot of water until soft but not falling apart. Steam the rabe over the boiling potatoes until wilted but still bright…five or ten minutes. Rinse under cool water, chop quite finely, set aside. Drain the potatoes, let cool till you can handle them, then chop into big chunks (if they’re small enough you can leave them whole). In a large flat bowl combine the tomatoes, mozzarella, herbs, balsamic, olive oil and olives. Set aside. In a large skillet over medium heat, warm a little olive oil, add the garlic and the jalapeño, stir and fry until the garlic starts to brown. Add the cooked potatoes and the butter beans, and stir and fry until the potatoes start to brown and stick to the pan. Add the cooked chopped greens and the spinach and a little water so that you can scrape the potatoes from the bottom of the pan. Stir and cook until the spinach is nicely wilted. Tip the warm potatoes beans and greens into the tomato mixture, stir to combine. Top with pine nuts and spicy shoots, if you have them. 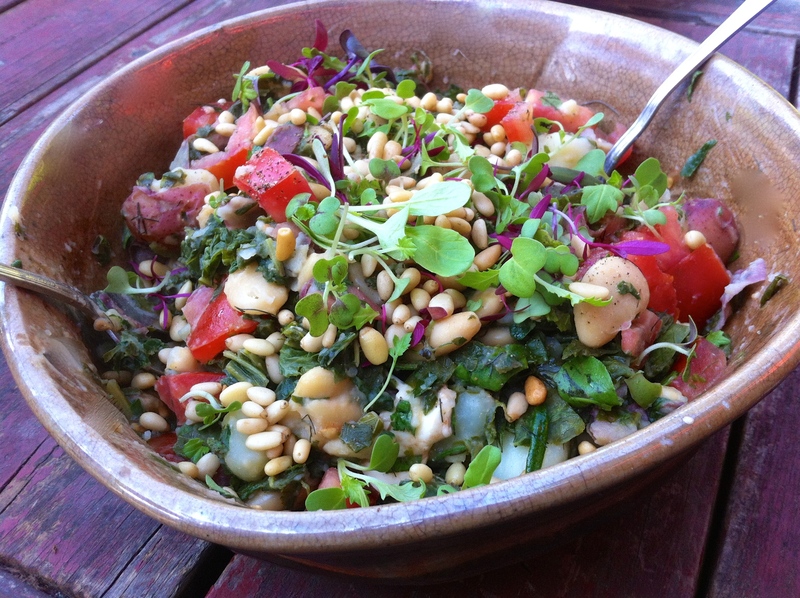 This entry was posted in beans, potatoes, recipe, salad, Uncategorized and tagged fresh herbs, pine nuts, potato salad, tomato mozzarella, warm salad by Claire. Bookmark the permalink. Yes! Warm potato salad! Tommy made something similar with leftover potatoes from a brunch a couple of weeks ago. It’s so satisfying. 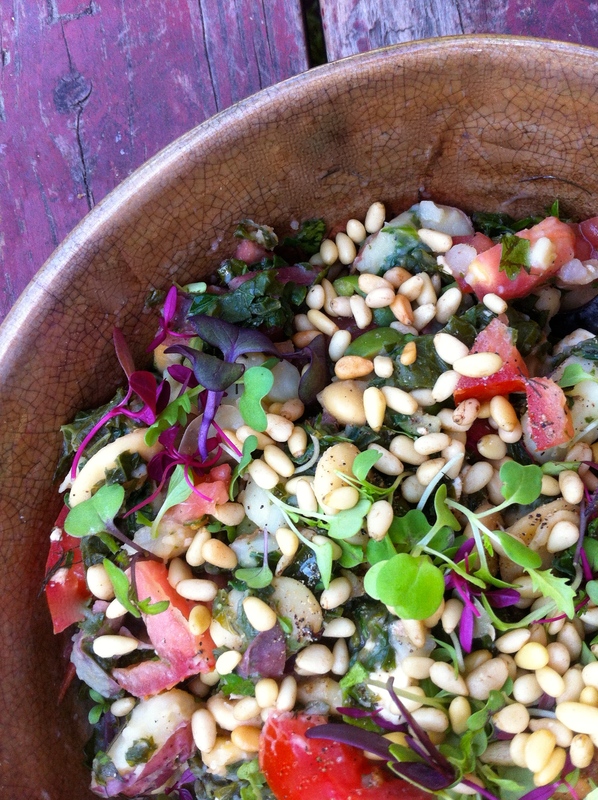 We have been eating a few warm/cold salads lately, and they are quite delicious. The other night he mixed greens with balsamic-roasted brussels sprouts and avocado and cold carrots. Delicious.